One of the primary goals of the IMI for New Functionality in Glass is to encourage and facilitate international collaborations that will lead to the creation of new applications and opportunities for glass. In order to provide an initial focus for collaboration, four main areas or thrusts have been selected as well as othertopics of research that may introduce new functionalities in glass. - connecting scientists (graduate students, postdocs, faculty and industry) across the world. This research exchange program is essentially a partnership between an academic institution within the US and another located abroad. More information on this program as well as grant and guidelines is detailed on our OPPORTUNITIES webpage. This principle has been adapted to provide a unique opportunity for undergraduate students to participate in an International Research Experience for Undergraduates (International REU program) for approximately 10 weeks during the summer. More information on this program is available on the REU webpage. - opportunity for faculty to collaborate with principle investigators and other faculty in other institutions. More information available on our OPPORTUNITIES webpage. - this grant is available to undergraduates, graduate and postdoc students who wish to travel abroad to present a paper or poster relating to their glass research at a Conference outside of the US. Participants have the opportunity to gain international experience, draw attention to research results in the US, network and build new collaborations. More information on this scholarship and how to apply is detailed on our OPPORTUNITIES webpage. - linking academia and industry both in the US and internationally to discuss key issues in glass applications, research and developments. All members of the glass community are welcome and encouraged to submit a one page summary of relevant thrust related work (research nuggets) for inclusion on our Web site. Consult our .DOC template describing the format for submitting a Research Nugget. 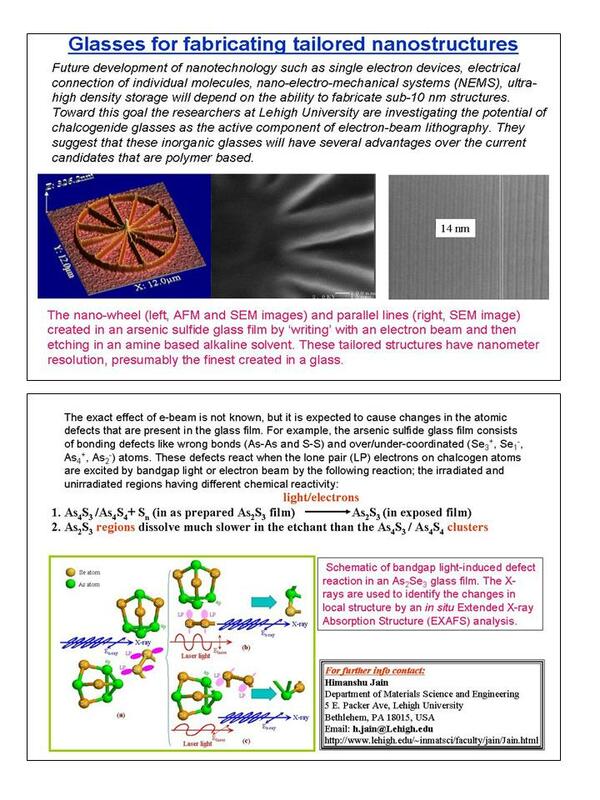 "Alkali-Free Glass as a High Energy Density Dielectric Material"
"Glasses for fabricating tailored nanostructures"
This material is based upon work supported by the National Science Foundation under Grant Number DMR-0844014.